Yes, I’m a conservative Christian. And yes, I’m a fan of Rachel Hollis. And I’m not ashamed of or embarrassed by that what-so-ever. We believe the Bible is God’s Word. And He provided us with His Holy Word as a guidebook for our lives. How to live. How to have a relationship with Him. And most importantly, how to spend eternity in His presence. Regarding our “Christian affiliation,” we are non-denominational Christians who attend The Church of Christ. You can read more about what the Church of Christ is in this post. I am probably the most conservative among my friends. Not only is my relationship with Christ THE most important relationship in my life. But we also don’t drink. We don’t cuss. We don’t have musical instruments in our worship services. And we believe baptism is essential for salvation. I am far, far from perfect. No one but Jesus has obtained perfection while on Earth. But I do my best to live my life for Jesus, to put Him first in all things and strive daily to obey His Word. So yeah, I’m conservative in my religious belief system. In my faith. In my personal walk with Jesus. When I first picked up Girl, Wash Your Face I was expecting an “I am woman hear me roar” type read that would probably be filled with feminism since that’s the “in” thing right now. I honestly assumed I’d be rolling my eyes through it and annoyed by it. I’ve just never been a big fan of the whole “girl power” thing (nope, I wasn’t even into the Spice Girls). I had no idea that it was published by a Christian publisher. No idea that Rachel herself is a Christian. I had no expectations of it being a Christian book about God. I bought it as a light-hearted read. I assumed it was a secular book, most likely containing ideas that are popular in society (Why else would it be FLYING off bookshelves right? Surely it must be pure wordliness in order to be so dang popular in the world!). As I read through it I was instantly drawn to Rachel’s voice and style. I felt like she and I are very similar. We’ve been through some junk and we aren’t shy about sharing it. I love her real-ness. Rawness. Hello my tagline is “oversharing and owning it” so obviously I’m drawn to personalities that aren’t afraid of being their true selves – no matter how others may respond. I love her relatability. She has a great way of sharing her thoughts while making it seem like she’s speaking directly to you. Rachel Hollis gets me. And so many women feel that exact same way. I felt an instantaneous connection with her and find it a total compliment when people say I remind them of her. I was surprised, in the best way possible, when she talked so openly about her faith. Her life choices based on her personal convictions and her love of Jesus. I thought it was so awesome that this super, crazy popular book was one that had so many mentions of Jesus and I kept thinking about how many people may have been lead towards learning more about the Lord by simply deciding to read a random book they saw on social media. The book wasn’t at all what I’d been anticipating it to be. It was a beautiful blend of personal stories and motivation towards becoming the best versions of ourselves. It’s a perfect first book to read if you’re looking towards some personal growth and not sure where to start. As Rachel says herself, she’s not acting like she has all the answers. She simply shares her story, her path, what has worked for her in her life and she hopes by sharing her truths that others will be inspired to ask more questions in order to begin their own story of personal growth. That’s exactly what her book did for me. I read it and felt on fire to dive deeper into personal growth. I picked up other books. I read more. I prayed more. I studied God’s Word more. I found appreciation in the everyday moments and started shifting my focus in a totally new, positive, way. Exposing myself to the inspiration Rachel shares has completely changed my daily routine. I drink water like I’ve NEVER done before. I keep promises to myself that I would have quickly broken in the past. But, most importantly, I wake up earlier each morning and spend time focusing on gratitude, scripture, and prayer. Not only have I been doing my own journaling each day where I write down 10 things I’m grateful for, items I want to specifically pray about, and a daily Bible verse but I’ve also made it a mission this year for our family to live in a state of gratitude. 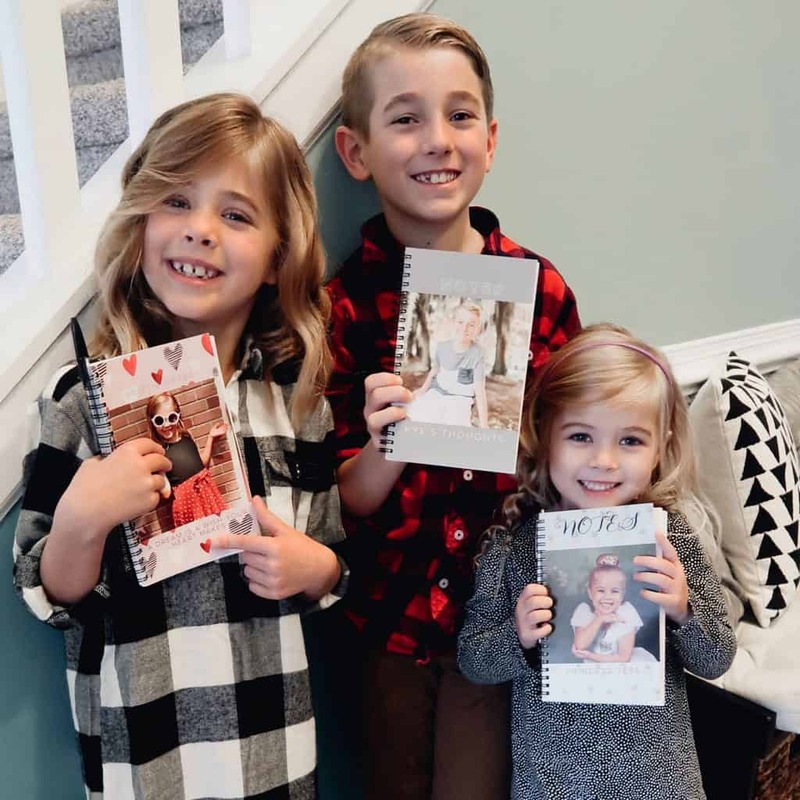 I’ve purchased each of our older children their own journals and they, too, begin each day a little earlier with time for God’s Word and writing out things they are thankful for. This small, simple change has had a huge impact on all of our lives. Our outlooks. Our attitudes. And our appreciation and love for each other. 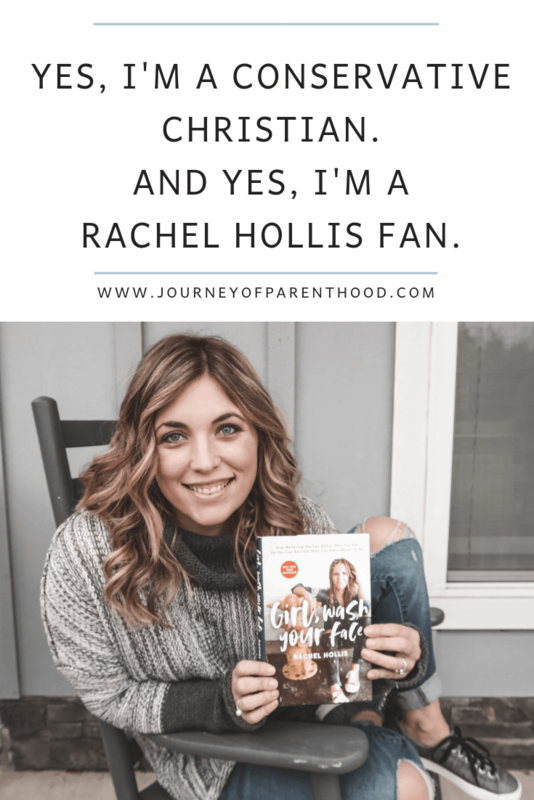 I have openly shared my support of Rachel Hollis. I listen to her podcast, I watch her Facebook Lives, I share her quotes, I’ve preordered her next book, I even drove 90 min one way to see her documentary in movie theaters (and took notes!). I’m a fan. As I’ve shared bits and pieces of what I’ve personally enjoyed from her content, I’ve received many messages. Of concern. I’ve had multiple people share an article with me that has gone viral regarding Rachel’s beliefs, faith, and her lack of sharing the Gospel in her book. Criticism saying that Rachel’s view is “ME” focused rather than “Jesus” focused. While I appreciate everyone reaching out in love towards me and their concern regarding these matters (as I’m ALWAYS an open door y’all, please never shy away from sharing things with me)…it also really shocks me. Everyone knows I LOVE Disney. Y’all. Disney is one of the most liberal companies out there. Yet no one has ever come to me with concern that I’m openly supporting a company that goes against so many Biblical truths. No one has come to me to say that when I give my little movie reviews about rated R films filled with inappropriate language, sexual content or violence that I’m leading people to sin. No one has commented that our Monday night routine of watching The Bachelor doesn’t align with my Christian morals and values. Or that the books we read for our monthly Book Club aren’t Christian-based in any way, shape or form. Yet I keep being told that I have a responsibility as a Christian woman to avoid Rachel Hollis and her content due to my public stage and potential influence on others. I think it’s great that she talks about Jesus. Period. I don’t think every book that mentions Jesus needs to also go through the steps of salvation. Or preach the Gospel. Or talk about the Holy Spirit. Or use tons of Bible Verses. I love Tim Tebow. I adore Lysa TerKeurst. I appreciate the many people in a public spotlight who boldly profess their faiths and devote their lives to helping lead others to Christ. But the reality y’all? We aren’t all Tim Tebows. We aren’t all loud and proud. Sometimes we are softer. Sometimes we have a lighter touch. And sometimes? Sometimes that’s the BEST way to reach people. The reality is that the Tim Tebows of the world can sometimes push people away from Christ. It seems too high to reach, too hard to achieve. We look at someone as straight and narrow as Tim and we think “Man I could never be as good as he is.” And so often when the bar is set too high in our minds? We don’t even attempt to make the first step. We feel doomed before we even begin. Personally, I found Rachel’s mentioning of faith in the book very similar to how I handle my own in this very blog. It’s important to me to find the delicate balance of never shying away from sharing my faith but to also not ever push too hard where people may feel isolated or “preached at” when they read my posts. Being reliable, sharing my struggles, meeting people where they are at, doing all things in love. These are the things I personally believe are ways I can best help lead others towards Christ. And my opinion is that Rachel is approaching her faith in a similar way. I do not agree with everything written in Girl, Wash Your Face. And from what I know about Rachel, I don’t agree with many of her personal beliefs. But the reality is I’ve never found a book where I agree with every word except for the Bible. And I’ve never found a person that I agree with 100% either for that matter. Every friend I have has differing beliefs on one thing or another, even my husband and I don’t always agree on every matter of faith. ANY book, devotional or Bible Study I read as well as ANY preacher, teacher or friend I hear speak I have to compare to God’s Word and His Word alone. We have to always be mindful of that. We have to be able to stand firm in our beliefs and convictions and be able to pick and choose what parts of the world we allow into our hearts. Take what is helpful to us and toss the rest. Yes, Rachel could do more. She could say more about Jesus Christ. She could be more Christ-focused. But she could have also done a whole lot less. I have heard Rachel speak about the backlash she’s received from the Christian community and y’all it’s just crazy to me. How about we try supporting anyone who is brave enough to speak up about their faith? Especially in a day and age where it’s SO unpopular and SO unsupported to do so? Or don’t even support them if you don’t want to…how about we simply just don’t bash them because the way they shared their personal story wasn’t how WE think they should share it? And as far as Rachel Hollis’s book being published by a Christian publisher. I may have this totally wrong but my assumption (and a quick Google search backs me up with this) is that an author writes a book then finds a publisher. If Thomas Nelson (the company who published the book) didn’t think it was “Christian based enough” then they shouldn’t have chosen to publish it. Yes, Girl Wash Your Face is a book about self-love. Self-care. Self-growth. A common critique I’ve continually read is that the book doesn’t focus enough on Jesus being the reason. Jesus being the doer in our lives. That Rachel focuses too much on self-congratulations and self-credit and doesn’t give God the glory. I agree with that on many levels. However, I also strongly believe that God gives us the TOOLS and it’s up to US to put in the WORK. That is the message I took away from the book. Not that God isn’t the one getting the glory, but that we’re aren’t glorifying Him when we leave our talents on the doorstep and ignore the gifts He’s blessed us with. I also think people need to keep in mind that Girl, Wash Your Face is a personal growth book. In the SELF-HELP section. Not the Jesus-Help section. The self-help section. A book about helping yourself is going to have a strong focus on how to help yourself. Rachel talks a lot about being a warrior. The hero of your own story. I understand that many Christians give her heat for that and say that Jesus is the hero. And He is y’all. He is the Creator, the Father, the Provider, The Hero. But that doesn’t mean that you can’t also be one. My take on Rachel’s idea of writing your own story is that Rachel chooses to be the hero rather than the victim of hers. And we have that choice. We can choose to let the difficulties in life define us. Choose to let them control us. Choose to let the hurts we’ve faced be an anchor that holds us back from achieving our goals. OR we can choose to use our scars as a reminder of where we’ve been and put our focus on where we are headed. We control our moods. We control how we spend our time. We control the path we take in life. God gave us free will guys. He wants us to have that ability to choose. Love Jesus. Love Yourself. I understand the belief that we should lean on Jesus in every struggle. For every answer. But I personally believe that it’s healthy to have personal growth resources outside of just God’s Word. Sometimes a person may say something a certain way that resonates with us and can help us grow in areas where we aren’t growing. Sometimes we have tougher life struggles that maybe the Bible doesn’t have specific examples about or exact methods for working through things. Yes, prayer. Yes, scripture. Yes. Yes. Yes. But sometimes? Sometimes we may also benefit from other views, perspectives, ideas, and support. And as long as we are secure in our foundation and our beliefs then I also think it’s healthy to expose ourselves at times to ideas that may not always align perfectly with our belief system. We don’t grow by only being around people who think exactly as we do. We don’t question things, dig for answers, or deepen our faiths by only being exposed to beliefs that are the exact same as ours. I’m not going to go into detail over the areas where I disagree with Rachel. There are many. But I bet if you and I sat and talked that there are probably many ways we’d disagree on things as well. I choose to love. To look for the good. To minimize the negative. At the end of the day, we aren’t going to be spoon-fed anything. We can’t just sit on the couch and wait for God to be a wish-granting genie who magically makes our dreams come true. And we also can’t just read a book and expect the author to align with every single Biblical idea. We have to read God’s Word. Dig deeper. Find those answers for ourselves. Get off our butts and make our dreams happen. Make our relationship with Christ deepen. God does His part. He provides us with all we need. We have to choose to show up in our own lives and achieve the goals our heart’s desire! That goes for my content just as much as anyone else’s. Don’t just read what I write in a blog post, or hear what I say, or see what I do and take it as Truth. I’m learning, growing and changing every day too. I’m far from perfect and am far from having all of the answers. All I can offer is my own personal take on things. My opinions. My feelings and thoughts. My perspective. So yes. I loved Girl, Wash Your Face. It was a book that pushed me to make major changes in my life that have resulted not only in a better ME, but have also resulted in a stronger relationship with Christ. And yes, I am a fan of Rachel Hollis. I may cringe at some things she says. At some of her personal choices. At many of her personal beliefs. But I’m strong enough in who I am and what I believe in to not be swayed by the opinions of others. I hope that when I recommend reading her book, or share her quotes, that you can take pieces away that help you in your personal growth journey. My goal in my blogging is to always be fully transparent and true to myself and who I am. 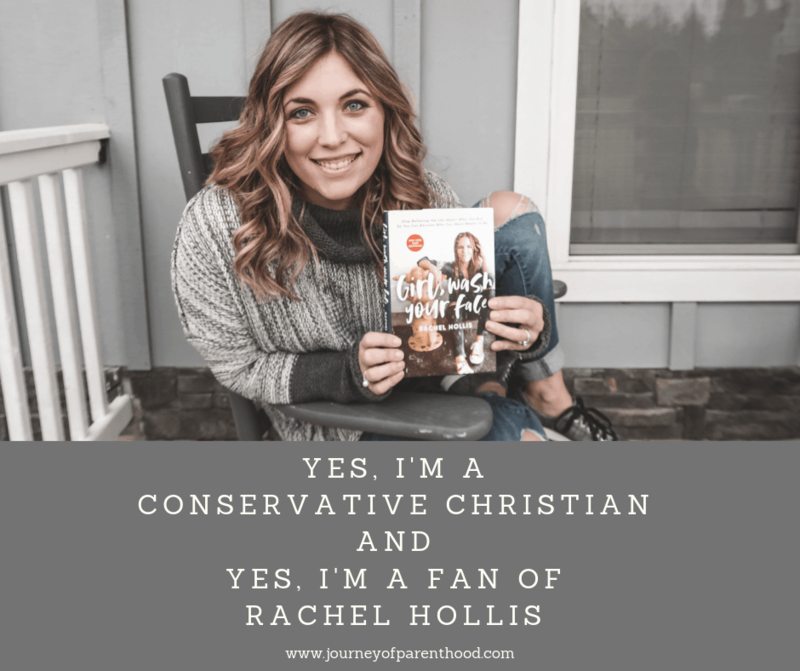 And I’m a Conservative Christian who is also a Rachel Hollis fan. Very interesting blog posting. I read the book. I didn’t LOVE it, but I also didn’t really understand the flak it caught. I definitely took it the way you did- God is clearly the hero, but it is up to us to get off our butts and use our God-given talents/gifts to the best of our abilities. I haven’t read the book. I wanted to read it then was discouraged by the backlash. I’ll admit that’s what stopped me. But this here.. it is encouraging and I will put it back on my list to read. Thanks for your positive outlook. Keep it up! I found your post accidentally and was intrigued! I have not been a woman of faith at all, Christ has not played a role in my 44 year old life. Rachel Hollis in her quiet promptings has lead me to search deeper into who I am and where I’m going which has lead me on a new path which DOES include a spiritual journey at its foundation. I AM one of those people who need the subtle guidance and not a “Tebow” force. She’s helped me to want a better life for myself and my family. I find it sad that she’s received backlash because I owe her a debt of gratitude that she’ll never know. A person of faith, believer in Christ should know one thing…not our place to judge. I’m sure when she meets her maker, he will embrace her AND THANK HER for living a life that brought so many woman back to him! The judgement and negativity in others does not come from a place of love or being Christ like. The man I’m learning to love in my life would show her love, after all she is a daughter of God too! Such a great post, Emily! Thank you for sharing. I read the book and then found myself explaining it to my friends who had only heard of the backlash but I do think she makes some really good points that can help you in your Christian walk. I really enjoyed this post! Thanks for writing, I was super surprised when I heard about the backlash. When I googled it, I found your blog. Really enjoyed the other posts.